ANDY'S NOTE: This is one beautiful park that includes seven distinct habitats. Natives lived on this peninsula for at least 4,500 years. Around the year 800 AD natives began to construct what is the largest indigenous mound in the Tampa Bay area, the Portevant Mound. Special plants to note here include the abundant Doctor Bush, our only native Plumbago species, that seem to pop up everywhere near the main mound. There is also the ancient protograin Huauzontle which grows along the far beach trail at the northwest end of the 365-acre preserve. The massive Moreton Bay Fig tree that is well known to visitors here, with its large buttress roots, has been doing poorly as of late. Storms and fungal infestation is taking a toll on this massive tree that is native to eastern Australia. Australian aborigines made fishing nets from the tree's fibers. In its native land it may reach 200' tall. The small purple fruits are typical syconiums, with flowers located within the fruits. The ripe fruits are edible but "unpalatable and dry." There is a nice nature center that is open during limited hours. Some beautiful blue-flowering Skyblue Clustervines, Jacquemontia pentanthos - Convolvulaceae, has been planted on the side of the nature center. It is a Florida state-endangered species native to the four most southern counties only. Bourreria succulenta - BAHAMA STRONGBARK - Native, endangered. Ardisia escallonoides - MARLBERRY - Native - Fruits are edible. False Mallow - There is an abundant False Mallow at this park, a Malvastrum species. It may be M. corchorifolium, our native FALSE MALLOW. M. americanum, INDIAN VALLEY FALSE MALLOW, another native reported from only two counties, or M. coromandelianum, the non-native THREELOBE FALSE MALLOW (this species is known as Chirubenda in Indian where the tender leaves are eaten as a vegetable. Also, in India, the fresh crushed leaves are applied to relieve pain and the flowers are taken as a diaphoretic.). 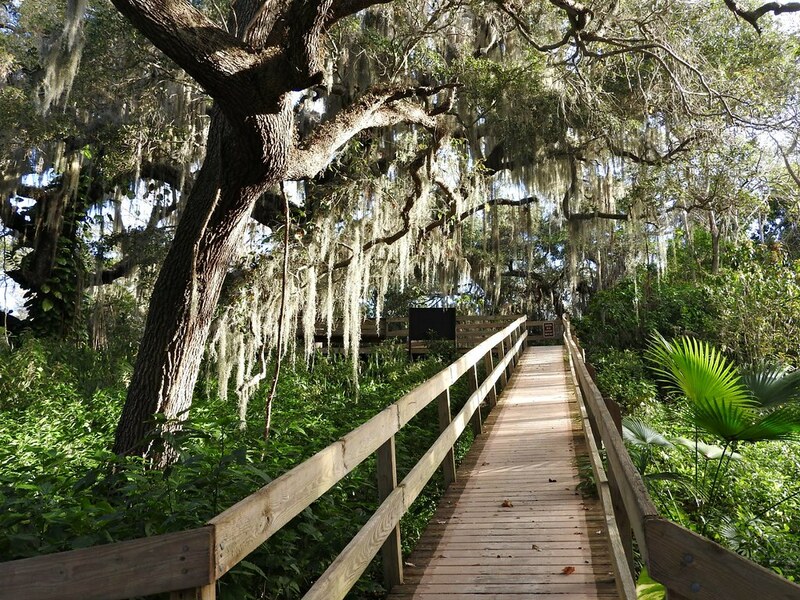 Gumbo Limbo - there are some whoppers to be found at this preserve. Potato Tree - Solanum erianthum - Native - Leaves used to clean grease from dishes in the Philippines. Fruits can cause nausea and worse and have been used to make arrow poison, however, the fruits are cooked into curries in Southeast Asia according to Mansfield's Database - THIS IS NOT RECOMMENDED.). Skyblue Clustervine - Jacquemontia pentanthos - Convolvulaceae - A Florida state-endangered species native to the four most southern counties only. Turk's Cap Hibiscus - Malvaviscus penduliflorus - edible red flowers are quite yummy (minus the green calyx).